Long Range Drones [Summer 2018] Comparison graphs included ! Imagine this – you’ve just got a brand new drone and you’re preparing to explore majestic places… only to find out it cannot reach as far as you’d like. While that can be a rather stressful moment, it can easily be avoided by taking greater care during the purchasing process. If you’re tight on money though, things can get pretty tricky as your long range drone options will be limited. Still, for less than $300 you can get drones that can go close to 1 kilometer away from you without any issues. So, with everything mentioned above taken into consideration, I would like to present you with our list for today – best long range drones available on the market. The list itself is divided into 3 subcategories each reflecting a certain range threshold. With that said, I don’t see a reason to beat around the bushes any longer – let’s get right to it and see how far can a drone fly ! Yup! Altair AA108 is ridiculously cheap but still retains decent performance. How is that even possible? Well, lately everything around the drone technology is dropping in prices as the tech itself advances and new products are widely available. Drones are becoming more and more like smartphones with each new generation lasting for roughly a year or so. So, needless to say – as time goes by cheap drones are getting better and better. It’s all getting to the point that these entry-level drones such as Altair AA108 have more advanced features such as adjustable flight skill levels, out of range/low battery alarms, emergency landing and to top it all off – HD FPV. Yup – Altair AA108 comes with a built-in camera that can record videos in 1280 x 720 resolution. It might not be the prettiest image out there but it’s still good for the price. If you are more interested in what this drone has to offer as far as actual performance is concerned, then you’ll be happy to know it sports somewhat of standard specifications for its price tag. In fact, Altair AA108 can go all the way up to 10 minutes per charge which is actually slightly more than I initially expected. 80 to 100 meters of operating range isn’t half bad either, I’m sure you will all agree with me on that one. All things considered though, Altair AA108 is a great budget-friendly drone that can be a great first-time model for virtually anyone willing to try it out. Perhaps not so well known, Holy Stone still remains close to its roots… and that would be awesome beginner-friendly long distance drones available for quite aggressive price tags. Essentially, that’s what HS300 is all about too. It’s basically an affordable training drone for future aerial photographers. It’s stable, sports a camera and won’t make too big of a dent in your budget. So, with all that taken into consideration, let’s further examine Holy Stone HS300 before making a proper decision about it! Holy Stone HS300 comes equipped with an FHD camera. This means it is able to record videos in 1080p at 30fps which, I’m sure you will agree with me, isn’t half bad. There is also HS400 by Holy Stone as well. This one comes with FPV but has a lower grade 720p camera with a WiFi FPV module. So, if you are more interested in flying FPV, then HS400 might be a better choice for you. Back to Holy Stone HS300 – it comes with several awesome features that are bound to be of great help to beginners and first-time users. I am talking about altitude hold and headless mode alongside with one key takeoff and landing. This feature set ensures optimal performance in an easy to use environment. Obviously, beginners will be very thankful for all this. How is that possible? Well, don’t get me wrong – this thing is nowhere near DJI Mavic Pro’s stability… But it’s still more than praiseworthy considering its price tag. Specifications are on point so no need to worry about them either. If you asked me how far can a drone fly, answer would be : 100 to 150 meters. Also, you’ll get cca 10 minutes of flight time, you should be all set for marvelous adventures with this little fella. Now we are taking a closer look at a brand new model by MJX – a brand that has stirred quite a bit of dust in recent months. It all started with their Bugs 2 series which are a huge hit even to this day. As a matter of fact, Bugs 2W is listed below with marvelous operating range that goes up to 1 kilometer. Pretty sweet, huh? But, for now, we will be focusing on its little brother with more humble specs – MJX Bugs 3 Mini! So, without any further adue let’s see what’s this little mini-drone all about! Starting off with the obvious – MJX Bugs 3 Mini is an entry-level racing quadcopter equipped with acro mode. For those of you who don’t know what this is, it’s basically a flight mode in which self-leveling is turned off, allowing you to take full control over it. Yup – this is what all professional drone pilots use as well as those who love to enjoy freestyling. But… there’s a problem that stops MJX Bugs 3 Mini from being the best ready to fly beginner friendly racer available on the market. How come? Well, it doesn’t come with a camera meaning you won’t be able to enjoy FPV flight with it… and that’s what acro mode is all about. On the other hand, specifications are absolutely brilliant coming at such an aggressive price point. 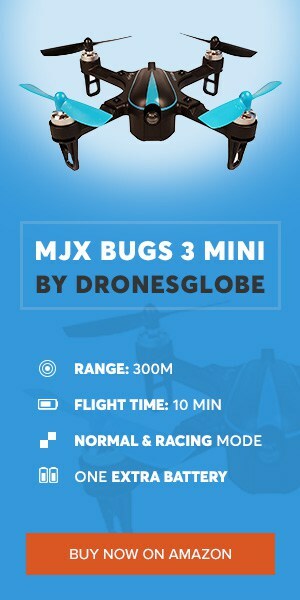 You see, MJX Bugs 3 Mini can reach from 200 to 300 meters and fly around for 10 minutes. As previously mentioned, the biggest downside of MJX Bugs 3 Mini is the fact it does not sport a camera. However, there is an easy fix for it which includes a small dose of DIY spirit and cca $20 for a miniature camera + vtx combo. Of course, this is taken with the assumption that you already own a good set of FPV goggles. If you don’t – you’re looking at another cca $50 for an entry-level model. Is it all worth it? Well… yes! Even with all those additional accessories, MJX Bugs 3 Mini is still a highly affordable drone and well capable of providing valuable lessons to beginners. As a matter of fact – that’s what it’s all about! UDI is a very respectable name in the long distance drone industry so it’s not surprising to see one of their models listed here. As the title implies, we are talking about their U818Plus model which turned out to be one hell of a product! Paying a modest price tag for a well-versed drone such as this one will surprise some of you… but that’s all part of its charm. And that’s basically why we are going to take a closer look at it! Shall we start off with this little bugger’s general performance? UDI U818Plus is a damn fine model with stable flight and easy to use controlling scheme. So much that my wife, who doesn’t fly drones all that frequently, managed to get the grasp on it during her first flight. Specifications are marvelous too. Answer to a popular question “how far can a drone fly” is : 13 to 15 minutes, and close to 150 meters of range, so you can expect roughly the same numbers. Keep in mind though – our test was in a wide open field which might skew the numbers a bit. If you would like to shoot occasional aerial videos or snap a quick dronie (aerial selfie, for those of you who aren’t on point with drone slang… cough cough), then this little bugger is going to amaze you. True – it does sport merely an HD camera, but it incorporates an anti-shake mount which works quite well. There will still be some vibrations, but much less than what’s usually the case with drones in this price range. In order to connect this drone to virtually everyone, UDI ensured a set of beginner-friendly features to guide users through their first flying steps. That is why you will be able to find the likes of altitude hold, headless mode as well as one key takeoff/landing. So, now that you know pretty much everything you need to know about UDI U818Plus, will you agree with me when I say that it’s well deserving of the 2nd place here!? And the best long range drone that goes below the 300-meter mark is Yuneec Breeze. We are talking about a highly compact selfie drone here. It can be controlled through its dedicated smartphone app as well as a physical controller purchasable separately. With an excellent camera, a fine set of autonomous features and decent performance, it’s definitely a worthy consideration for some of you! Of course, we should not forget about its camera either. Yuneec Breeze is equipped with a true 4K sensor that shoots ultra HD videos in 30fps. However, keep in mind that there’s no gimbal here so you will experience some vibrations in your footage. Luckily, Yuneec has a quick solution for your issue – simply lower the resolution down to 1080p and turn on electronic image stabilization and you will notice a big difference in smoothness. One of the biggest virtues of selfie drones is their versatility in terms of features. Yes – these compact buggers sport all sorts of extra functionalities to aid to their users. Since they are considered as purely casual drones primarily intended for beginners, such a connotation comes as no surprise. So, what exactly is Yuneec Breeze equipped with? First of all, there are 5 completely autonomous flying modes: orbit, journey, follow me, selfie and pilot. Undoubtedly, you will spend most of your early time flying just tampering around with these features. In addition to that, Yuneec Breeze sports quick and seamless social media sharing as well HD FPV. Overall – as far as selfie drones are concerned, Yuneec Breeze poses like a great entry level solution! At the 5th spot, we have a miniature racing drone, one of those micro brushless FPV racers that have taken the entire market by storm. As you can see, it goes by the name Kingkong 90GT and it shows excellent promises of being a great entry-level racing starter’s pack. There are some caveats about it, but more on that later on… For now, let’s take a closer look at the package to see what exactly are you getting inside. Before going in-depth about Kingkong 90GT, it has to be said that this is not a ready to fly model (more often referred to as simply RTF). What this means is that you will have to provide your own transmitter to use with this drone and that’s not for everyone considering RC transmitters aren’t exactly everyone’s cup of tea. As far as official support goes, Kingkong 90GT offers a wide variety of receiver support including the ever so popular FrSky and the entry-level FlySky as well as more. With that being said, you can rest assured that there will be a receiver working with your transmitter if you opt for the bind and fly version. The basis of this build is Kingkong’s F3 Lite FC… but it has a couple of big drawbacks to its name. First of all – it doesn’t support OSD or buzzer meaning you’re left without any kind of battery telemetry at all. With that said, it means you won’t be able to find Kingkong 90GT that easily if it falls in a bush or something similar. ESC beacons are still here… but they are not that loud to begin with. As for the actual performance, Kingkong 90GT is bound to impress even the most skeptical ones of you. It runs on 1103 7800kv brushless Kingkong branded motors with solid low rpm torque and good punchouts. They are connected to a 3A 4 in 1 ESC which limits it to only 2S batteries. One comes with the package bearing 350mAh capacity which provides decent performance and no sagging. Going back to the package, Kingkong 90GT comes with 4 spare pairs of 1935 propellers but doesn’t come with a battery charger. 2S chargers aren’t that expensive though so it’s not going to be a huge investment on your end. Lastly, Kingkong 90GT can fly around for 5 minutes, perhaps a bit less than that if you’re going all in with it. Range heavily depends on your receiver and transmitter combination, but you can generally expect around up to 300 meters. The best thing about MJX Bugs 3 are surely its brushless motors. To be more precise here, we are talking about 1806 1800kv brushless motors which are paired up with independent ESCs as well as a 2S 25C 1800mAh LiPo battery. Thanks to all these parts, MJX Bugs 3 performs absolutely great and is highly stable. Plus, since it sports 1 key 3D flips, you will get to see a massive 310mm drone weighing close to half a kilogram doing acrobatics. That’s an awesome sight to see, mark my words! Yup, that’s right – MJX Bugs 3 is among the cheapest drones out there that can actually carry GoPro and other brands of action cameras. There is a special mounting bracket which allows this in a simple and fast manner. Last but not least, I should state the specs of this bad boy. Starting off with flight time, you can expect roughly 13 t0 15 minutes (how far can a drone fly), depending on whether or not you have an action camera equipped on the drone itself. Operating range fares quite well too with approximately 300 meters being the maximum. The third spot is reserved for a very special long distance drone unlike any other featured in this entire article. The name is Traxxas Aton and its biggest virtue is definitely its versatility. We’ll go further in-depth about this later on… so, for now, I’d like to point out that Traxxas Aton can perform as 2 completely different drones. With that as our focal point, let’s kick things off with Aton by Traxxas! First of all, let’s make one thing clear – Traxxas Aton is basically 2 drones in a single package. It’s all thanks to its sophisticated flight modes which offer 2 completely different experiences. Photography mode is in charge of producing an excellent performance for, you’ve guessed it, photographers. Simply slap on the camera mount, attach landing legs and turn this mode on. You will notice your Aton being quite stable, allowing you to capture brilliant footage from above. Sports mode, on the other hand, gets rid of that extra bit of stability as well as eliminates all speed-related limitation. This results in nervewracking speeds of more than 70mph. Luckily, Traxxas Aton is agile enough in order to perform all sorts of high-speed maneuvers. And we are talking about a quite big drone… Crazy, huh?! And trust me – as far as aerial photography is concerned, this camera birdie is an excellent choice. Once again, it’s all thanks to the dedicated Photography mode. But that’s not the only thing worth mentioning here. You see, I overlooked the fact Traxxas Aton doesn’t come with a camera but with a 2-axis gimbal that works with GoPro action cameras. I don’t have to be the one to tell you that this is the best way to go if you’re serious about becoming a professional aerial photographer. Last but not least, Traxxas Aton good flight time, hovering close to 15 minutes. Operating range, on the other hand, goes to approximately 300 meters, just enough to land on this list. What’s best about DJI Phantom series of drones is their performance, there’s no doubt about it. They are the exclusive branch of what’s available on the drone market as far as technology is concerned. On the other hand, they are extremely pricey too which makes them unsuitable for everyone. However, some people are not buying them because of these qualities. Nope! Instead, they’re disregarding the price tag and buying them simply because they are gorgeous. If you are one of them, then I’m sure this next drone will be of interest. Why? Well, it goes by the name Upair One and it’s a freakin beauty!!! Upair One is not only a proper beauty but sports an advanced frame design which brings forth improved flight performance. Efficiency as well… It’s basically a U-shaped anhedral design which does a great job of improving GPS reception. But that’s not where the fun stops with this one. In addition to GPS, Upair One can also brag with altitude hold and pinpoint features, both of which are of great importance for the quality of aerial videos. Another noteworthy thing to add is that the quality of aerial videos heavily depends on the camera that comes with Upair One. Luckily, there is some really good news for you in this department. In other words, you can choose between 3 cameras – 1080p, 2.7K and 4K options are available at the moment. The last thing I would like to mention about Upair One are its specifications. More precisely, operating range and flight time… the same usual ones we’re so fond of mentioning. So, as far as the latter is concerned, you can expect anywhere from 16 to 20 minutes of flight time. Operating and FPV range are both good, standing high at 500 to 600 meters. All things considered, Upair One seems like an awesome choice for people wanting a stylish yet very intuitive and easy to use drone… And for that, it is placed as the runner-up here! For those who are looking at the more detailed side of the deal, this drone packs a 1080p camera which records in 30fps. GPS+GLONASS modules are here too, making satellite navigation a piece of cake. Extra reliability is guaranteed by 3 types of return to home. To top it all off, MJX Bugs 2W sports headless mode, long range FPV and altitude hold! As for the specifications, MJX Bugs 2W has an absolutely brilliant operating range that can reach close to 1 kilometer away from you. The battery in charge of powering this beauty of a drone is a 2S 1800mAh pack that produces up to 18 minutes of flight time per charge. Here comes the best part – in addition to such a good set of features and absolutely thrilling flight performance (as well as specifications), MJX Bugs 2W will also get you an extra battery. Yup – this means you will get somewhere around 35 minutes of flight time with both batteries. Keep in mind though – it will take around 8 hours to fully charge both of them so investing in an extra charger might be a good idea! Parrot Bebop 2 is known as one of the most widely used mainstream drones of today. And it’s for a good reason! You see, this charming little drone carries enough features and great hardware to justify its price. Heck, it even comes in several packages, one of which we will further discuss down below. One thing is for sure though – after reading the next 2 paragraphs I guarantee you will think very highly of this little bugger! Starting off with all the different packages, Parrot Bebop 2 will surely amaze some of you. For instance, there’s the Power package, FPV package and Adventurer package. We will be focusing on the latter so let’s see what exactly are we getting inside of it! In addition to the drone itself, Parrot Bebop 2 Adventurer will also come with a specialized backpack, CockpitGlasses and SkyController 2, all of which are far exceeding the total cost of this package. And they’re all worth the money too! You see, CockpitGlasses allow you to put your smartphone inside of them, enabling you to experience FPV and VR flying like never before. SkyController 2, on the other hand, does an amazing boost in the operating range and brings it closer to 2 kilometers. And finally, the provided backpack is stylish and spacey enough to fit all these accessories together with the actual drone. Overall, if you’re looking for an all in one drone package, Parrot Bebop 2 Adventurer is surely worth checking out! Now we are going to say a couple of words about this little bugger’s camera. Starting off with its quality, you are looking at a 13MPX CMOS sensor. Furthermore, it sports electronic image stabilization which ensures the optimal footage stability thanks to a sophisticated combination of algorithm and implemented software. Keep in mind though – we are not talking about a 4K camera. Instead, Parrot Bebop 2 Adventurer records footage at 1080p which should be OK for the majority of casual users. Moreover, the camera and EIS are not taking too much of a toll on the provided 3S 2700mAh proprietary LiPo battery. It is still able to retain around 20 minutes of flight time which is awesome for this price tag. Yup – Swellpro Splash Drone 3 is a unique drone thanks to the fact that it can record underwater footage. This feature here is not available with any other drone on the market, making Splash Drone 3 quite a special device. But how can it do this? Well, thanks to a floaty design, corrosion-protected materials, and completely waterproof camera+gimbal, you will be able to capture breathtaking shots of underwater wildlife. If that’s not enough for you to buy this drone, perhaps this next info will change your mind. You see, Swellpro Splash Drone 3 is a modular drone that enables you to switch from waterproof gimbal+camera to other modules such as thermal imaging, search and rescue, and even bait and payload for tech-savvy fishermen. There’s another thing you all need to know about Swellpro Splash Drone 3 – it is an absolute monstrosity. In the world dominated by compact and foldable drones, it’s nice to see Swellpro not falling under the popular influences and providing us with a proper beast! Additionally, Swellpro also did a great job in terms of features, implementing Follow Me, Mission Planning, Orbit and Return to Home among many others. Specifications aren’t falling behind either! Operating (and HD video downlink) range goes somewhere around 1 to 1.5 kilometers while flight time goes above 15 minutes. The latter heavily depends on the module you use so bear that in mind to avoid any possible mishaps. If you are worried that this compact little device won’t perform drastically better than DJI Spark, then I am afraid you are very wrong. If you opt for DJI Mavic Air Fly More Combo you will not only get its dedicated transmitter but a total of 3 batteries which will greatly amp your productivity and entertainment. Each of those batteries lasts for around 20 minutes which is more than enough, don’t you agree? Last but not least, DJI Mavic Air is an exceptionally well built long range drone capable of going from 4 to 5 kilometers without many issues. Features-wise, you won’t be missing out on anything with DJI Mavic Air. It has full support for DJI Go app which opens the door for the ultimate list of smart features including the highly popular ActiveTrack and TapFly. There are several new ones as well, making thrilling footage effects (that will outright blow your minds) a piece of cake. Probably the best thing about DJI Mavic Air lies in the fact that its camera is actually able to perform better than that of its big brother – DJI Mavic Pro. You see, even though both of these drones have the same maximum resolution capped at 4K and same maximum fps – 30… things become very different if we lower the resolution. With incremental drops in resolution, DJI Mavic Air retains higher framerate and bitrate of its videos, making it clear that it records higher quality footage than its big brother. It’s amazing, especially when we take into consideration the fact that DJI Mavic Air is such a small drone. The only hexacopter in today’s article is this one – Yuneec Typhoon H Pro Even though the Plus version (with several awesome upgrades) is coming out in the near future, this one is still worth mentioning due to amazing performance and state of the art features. Keep in mind though, there are several options of Typhoon H model available, but I warmly recommend getting the Pro version with Intel RealSense technology. If you do not have any budget limitations, this version offers the best value for money out of the whole bunch! Let’s not forget about this monster’s 14.8V 5400mAh LiPo 4S battery which is, I’m sure you agree with me, quite a bulky beast. With that being said, it comes as no surprise to see Typhoon H pro going close to 25 minutes in the air on a single charge. Furthermore, considering it’s such a huge and heavy drone (almost 2 kilograms of default takeoff weight), this bugger is actually quite fast. As a matter of fact, it can reach up to 70km/h in Follow Me mode and that’s outright amazing. As far as its camera is concerned, you are looking at the upgraded CGO3+ model featuring a 12MPX CMOS sensor with 98 degrees FOV. Obviously, this thing can record in 4K at 30fps which is somewhat of a standard for high-end drones nowadays. Lastly, I’d also like to go back to Intel RealSense Technology and say a couple of words about it. You see, that’s basically an advanced obstacle avoidance system that works with several cameras and sensors, ensuring the drone’s safety at all costs. Just like I already stated above – Yuneec Typhoon H Pro is a huge model sporting 520mm motor to motor in diagonal. If that’s not huge, then I don’t know what is… But just like the drone itself is huge… so is its transmitter. It must be said that Yuneec did one hell of a job with their ST16 ground station featuring 16 channels and a fully fledged Android-powered 7-inch tablet for FPV purposes. It sports tactile and audible warning feedback and can control the drone (and maintain a stable HD video downlink) for over 1.5 kilometers. Every good drone must have a solid ground station to make users lives easier. Luckily for this orange little bugger, Autel Robotics did a pretty good job. Not only is this transmitter stylish and ergonomic but it also sports huge and easily distinguishable buttons. As far as intutiveness is concerned, there is a very forgiving learning curve that’s there to cater users of all skill levels. The dedicated application used for FPV is polished too. It’s responsive, doesn’t lag even on older devices and is generally considered a good solution. Performance-wise, Autel Robotics X-Star Premium really belongs to the top of the food chain thanks to cca 2 kilometers of operating range. The situation with its battery duration isn’t much different. You can expect around 25 minutes of flight time which is like I’ve already said a couple of times already, the standard number of high-end drones. What kind of a long range aerial photography drone would this be if it didn’t have a proper camera? Well, no worries – Autel Robotics X-Star Premium won’t disappoint you. As a matter of fact, it might even surprise some of you with its stylish (yet very good) 4K camera mounted on a 3-axis gimbal for ultimate stability. It is backed up by several awesome autonomous flying features as well as those who take care of reliability. The latter means it sports the likes of return to home and magnetic interference protection which will save you a ton of nerves in the long run. Even with DJI Mavic Air being released a couple of weeks ago, DJI Mavic Pro is still on top of its game as far as operating range is concerned. Instead of opting for Lightbridge, DJI went with OcuSync for Mavic Pro which turned out to be a massive hit. Not only does it have impressive HD downlink and operating range but it’s quite power efficient too. Want to know more dirty secrets about this pinnacle of modern-day drone tech? Well, let’s jump right into it! The first thing that needs to be said about DJI Mavic Pro is the fact that it’s just a fraction of the size you’d come to expect after examining the fully sized DJI models such as their Phantom or Inspire series. Better yet – DJI Mavic Pro is foldable too, making it a breeze to carry with you anywhere you go. It’s really true – DJI drones are the best models currently available on the market if what you are looking for is strictly a great set of features. We also should not forget about its impressive specifications either. You see, DJI Mavic Pro is finely poised with the latest DJI OcuSync transmission technology that will sweep you off your feet as far as the operating range is concerned. If we are to be more precise with our unit of measuring here, DJI Mavic Pro can reach as far as 7 kilometers, not just the operating but HD video downlink range as well. That, combined with up to 27 minutes of flight time are, at least in my honest opinion, the main reasons why I believe this to be among the best long range drones on the market. I have saved the best (and most expensive) for last. Meet DJI Inspire 2 – an absolute best of a drone in every way, shape, and form you can think of. What this is is basically a highly sophisticated aerial photography platform with all the bells and whistles allowing it to be called the best investment for a professional photographer in 2017. And it’s true – this is not a drone but a flying camera crew just waiting for your commands. It’s really impressive once you start investigating deeper below its already brilliant surface… And for all that, there’s no question about its placement as the best long range drone currently available on the market. For everyone who already owns a well-established photography business, DJI Inspire 2 is a worthy investment. For others whose budgets might be limited, perhaps not so much. There are other, cheaper options which can do well in terms of professional photography without too many advanced gimmicks for experts. If you’re already set to purchase this birdie, then I guess there’s no other thing to do but to tell you more about it! Well, for starters, let’s see what sort of specs can you expect from it. As far as flight time goes, DJI Inspire 2 can output roughly 25 to 27 minutes, just like all other premium models from DJI lineup. Operating range is pretty sick too, ranging from 5 to 7 kilometers, depending on optical visibility and similar factors. Instead of going through its almighty design and drooling over its raisable motor arms, let’s just focus on the most important thing – imaging solution. For those of you looking for the ultimate aerial photography platform, there is no better option than DJI Inspire 2 coupled together with Zenmuse X7 gimbal+camera combo. This is basically the ultimate cinematic option which sports the Super 35 Sensor, can record in 5K CinemaDNG format as well as 5.2K Apple ProRes. On top of that, there’s also 14 stops of dynamic range for portraying the most vivid sceneries. Last but not least, Zenmuse X7 snaps 24MPX stills which bring forth amazing details and crisp lighting. This goes without any question – battery duration, operating range, camera quality, and FPV are all more or less equally important specifications of every drone: Sure, depending on their primary type of usage scenario, specs can be skewed in one way or another… But generally speaking – they are all of crucial importance for a drone to be any good. With all that in mind, it’s not surprising to see many peoples demanding drones with long operating ranges. After all, for certain industries, long distance drones are an absolute must. In fact, let’s take a look at which industries benefit the most from the above-listed drones! First in line, we have agriculture. In fact, tech-savvy agricultural businesses have been among the first ones to get special flying grants by the FAA. These grants allow them to use long range drones on their plantations for effective crop monitoring and fertilizing. For 3D mapping of larger pieces of land, chances are high you will be forced to work with a long range drone. Luckily, their outstanding range matches their mapping precision so applications in this industry are more than well mannered. Surveillance companies, coupled with agricultural, were the first in line to obtain FAA grants for frequent BVLOS drone monitoring during both night and day. So, with that in mind, surveillance companies working on huge properties are much better off with one of the above-listed drones. The FAA is still issuing a rather harsh UAV policy which is somewhat of a limiting factor for new potential drone buyers. Yes – when there’s a potential fine of up to $250,000 and even up to 3 years in jail on the line, people tend to be really cautious. Yup – those are the potential consequences if you’re caught flying above the maximum height limit of 400 feet or near airports and similar points of interest. And that’s only for casual users! Flying beyond your visible line of sight (BVLOS) is also a fineable offense so you must make sure you see your drone at all times. On the other hand, 2017 brought new rules to commercial drone pilots with a rigorous licensing system that requires signees to successfully pass the notorious Part 107 test. However, even after they pass the knowledge test and become fully licensed commercial UAV pilots, flying BVLOS and above 400 feet in height is still considered as breaking the rules. To bypass these rigorous rules and regulations, certain commercial users are now getting FAA to grant them special exemptions which allow them to use their UAVs above 400 feet and BVLOS. Drones that can go past 1 kilometer away from their respective transmitters are outright beasts and well capable of doing all sorts of demanding tasks. Of course, I am referring to commercial tasks too, many of which require lengthy missions while retaining HD video transmission. Under speculations it needs to specify the dc operating voltage! Long flight time is crucial for some aerial applications like inspection,surveillance etc.However current drone flying time is very limited,average 15-30 minutes,due to battery limitation.So I think the best solution for the time being is to use lightweight and tough enough uav frame,light enough components(motor,esc etc),appropriate battery.Also the VTOL fixed wing is a good option. Why are you calling these drones “Long range? ” I have most of these drones and a “true” long range should be able to go two (2) miles or more. But anyways, to most, these drones are probably “Long Range”. Thanks. We consider long range drones to be comercial drones with above average control distance. Obviously with time this average tends to increase. However, we believe all drones listed on the article are considered “long range” to any casual pilot. My intention is to make a light weight long duration long range drone for best Ariel & high end photography by assembling parts as per your suggestions. Please advise.